In the middle of Aldi’s frozen food aisle, I “did” church. Right in between the tater tots and frozen peas, I almost missed it. I’m so grateful I didn’t. Since I’ve been studying Scripture on imperfect hospitality, I’ve begged the Holy Spirit to heighten my awareness on the topic. After four decades of following Him, I’m having my own mini-revival in my own heart. It’s hard to explain, but He’s opening my eyes in new ways. He’s perked my ears to conversations that I typically stroll by, and He’s revealing powerful stories simply because I’m slowing down enough to walk this road of welcome wherever I go. Stay alert, aware, and engage are my mantras. I’m turning apathy into attentiveness. As I chaperoned a D.C. high school trip, my sister-in-love and I were tasked with meal prep. As I pushed my cart along the aisles of my favorite money saving store, I observed the oddest pairing of shoppers: an elderly white man and a young African American man pushing a cart together. I started eavesdropping on their conversation. The boy held up two items and he contemplated, “If I buy this, it’s twice as much as that, so I can’t afford both.” He put the treat back and the man gave a short commentary about his decision. Is it weird that I started tearing up? I can’t begin to explain how this moment impacted me. I stumbled upon an older man mentoring a younger man on the simple tasks of grocery shopping. A daily act that we take for granted. I inched closer and “went on my phone.” OK, I’ll admit it. I stalked them because I was so moved by this seemingly ordinary, mundane task. For the next forty five minutes, we “did” church together in an inner city grocery store with John, a 77-year-old white man and Kaqueen, a 20-year-old black man attempting to find focus for his future. “I don’t have any sons.” John remarked. We felt led to affirm Kaqueen’s value and point Him to the only One who can truly rescue him. “Yeah, we should be on TV,” Kaqueen determined. Clear the aisle because I jumped on ten soap boxes to affirm his significance and calling. Neither will I. Neither will I. Walk the road of welcome, my friends. There are Kaqueens and Johns waiting to share their story, and you never know where the Lord will ask you to share yours. I loved that! I want to find some Kaqueen’s. I have heard so many horror stories about teens in foster care that I have shied away. I am going to pray and rethink. I know, Rachel and I’m right there with you. I’ve heard the same hard stories, but I know how important it is to share the love that we’ve been gifted with. Praying right along with you. I’ve always said no child can have too many people who love him (or her). You don’t have to be biologically related to a child to make an impact. Sometimes, it’s just a smile or a kind word that can make a difference. Love this story. Love this story! They are both heroes. Thank you for encouraging them! 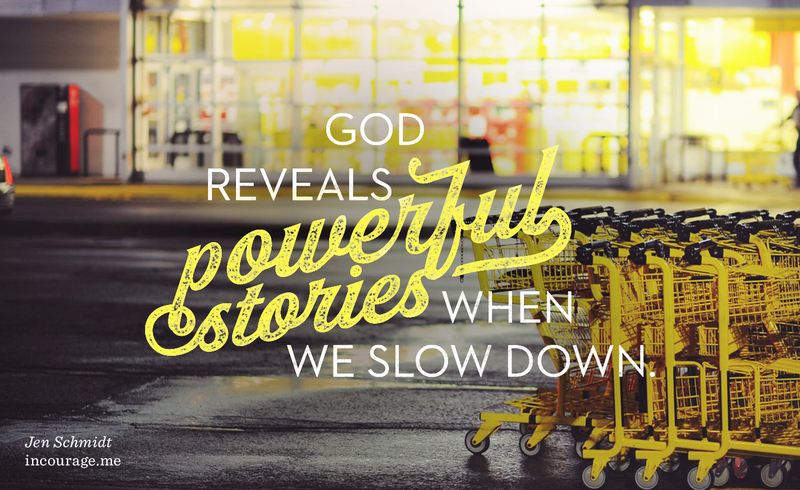 My husband came with me to Aldi’s for the first time just a couple of months ago and was fascinated – he said it was amazing to see ministry in motion (I can’t remember his exact words)… his main focus was the passing on of carts without a quarter exchange (for those that don’t know the system, I am sure that doesn’t make sense). I have had some wonderful conversations in Aldi’s – maybe because of the closer quarters overall vs. other traditional stores? I don’t know. I love the above story. There is hope for the future, isn’t there? I’m reading this and am encouraged to slow down and hear the needs of people around me. I want to be a part of where God is working but I need to slow down so I can hear. Thank you for the story. It brought tears to my eyes. You are so welcome, Jennifer. This past few years I’ve been working hard on creating margin in my life because I know I’ve missed so many moments like this without realizing it, so it’s a new start for me too. I cannot adequately express how meaningful, powerful, and encouraging I found this post. I laugh and cried, “Yesssss”-ed and praised clapped. Obedience, mentorship, being tuned to the miracles woven into the mundane. May God abundantly bless every person in this story. That is such a beautiful story. Thank you for sharing it and encouraging me. Thank you so much Jen for sharing this very inspiring story, a story about love ,;that love can overcome barriers if we just take the time to do so, to let Christ work through us. I am weeping sweet tears of joy. What an amazing story…thank you so much for sharing. It makes me want to be more conscious and slow down more often to be able to see God working around me. Beautiful! I have had several women come along side me to mentor me in their own special ways. I am grateful for those ladies and I pray I can demonstrate that as well! Thank you so much for sharing this – what a beautiful story of God taking the ordinary and making it extraordinary, simply because of obedience! He is so faithful!